Among the rarest documents at Library and Archives Canada (LAC) are those signed by Canada’s monarchs, and they represent some of the most important moments in the nation’s history. As part of our digitization programme, we recently scanned one such document that resides in the Ernest Lapointe fonds: a single sheet of paper that marks Canada’s entry into the Second World War. 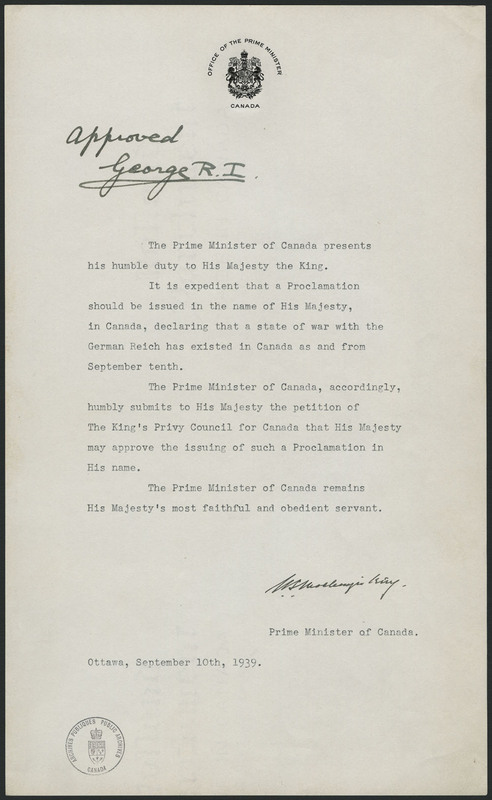 Signed by Prime Minister William Lyon Mackenzie King, the document is a request for permission to issue a proclamation declaring war against the German Reich. The king indicated his approval with a handwritten “Approved” and a signature: “George R[ex]. I[mperator].” Though a seemingly straightforward document, the date—September 10, 1939—raises a question. While this was indeed the day Canada declared war, as Lester Pearson (then working at Canada’s High Commission in London) observed, “some historian of the future will wonder how George VI and Mackenzie King could have been together on September 10th 1939.” (Pearson, Memoirs, 139) In the era before supersonic transatlantic air travel and the wireless transmission of documents it would have been impossible for Mackenzie King (in Ottawa) and the King George VI (in London) to have signed the same document on the same day. The answer to this conundrum can be found in LAC’s collections, and further research shows that this document was just one of several that had to be created to resolve a problem Canadian officials had never encountered before: How do we declare war? As the prospect of Germany invading its neighbours grew in 1939, Canada expected to have a role in the resulting conflict. Unlike the onset of the First World War, when British dominions like Canada had been assumed to be included in the British declaration of belligerency against the Central Powers, Canada now had the option of making its own decision. In 1926, the Balfour Declaration had established that the United Kingdom and the dominions were now autonomous in domestic or external affairs, and this had been formally enshrined in the Statute of Westminster of 1931. Fast forward to September 1939. As the Blitzkrieg rolled across Poland, prompting the UK to declare war against the German Reich on September 3rd, it was now up to Canada to decide its own fate—to join in, or to stay neutral. 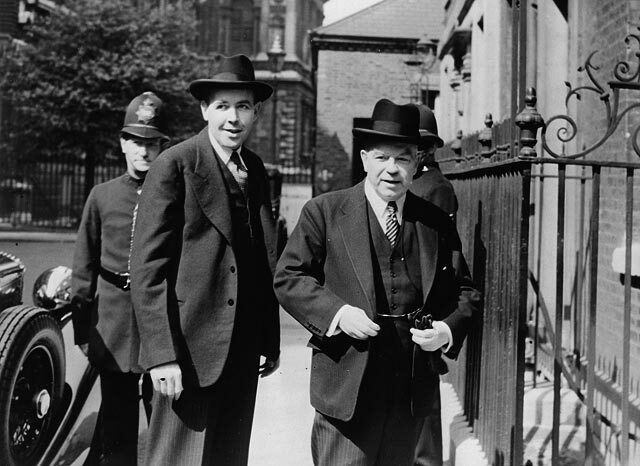 Most Canadians generally understood that Canada would be involved, if not militarily then at the very least economically, but Prime Minister William Lyon Mackenzie King wanted parliament to formally endorse the decision to enter the war. It did so on Saturday, September 9th. Major policy announcements such as declarations of war also required a formal proclamation to be issued by the governor general on the advice of the Cabinet of Canada. This advice was in the form of a formal request signed by a cabinet minister, called a submission, to the governor general. To issue a proclamation in this case, there were two obstacles to overcome. The other obstacle was that the two-page document that the king had approved had been written out in longhand from a telegram and was not signed by a cabinet minister, as was required. For this reason, External Affairs referred to this as an “informal approval” document and promised that a formal (signed) submission would soon follow. 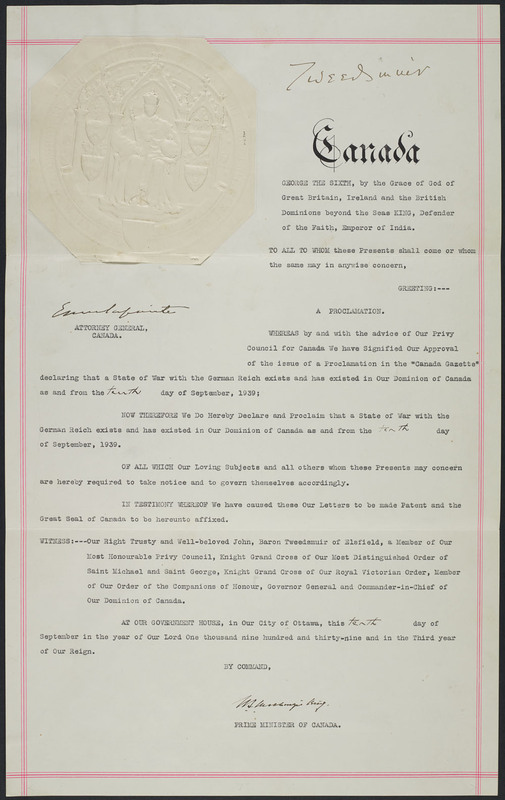 Even before the king’s approval had been received, the proclamation had been drawn up and signed by Governor General Lord Tweedsmuir (in the name of the king), Prime Minister Mackenzie King, and Minister of Justice Ernest Lapointe. 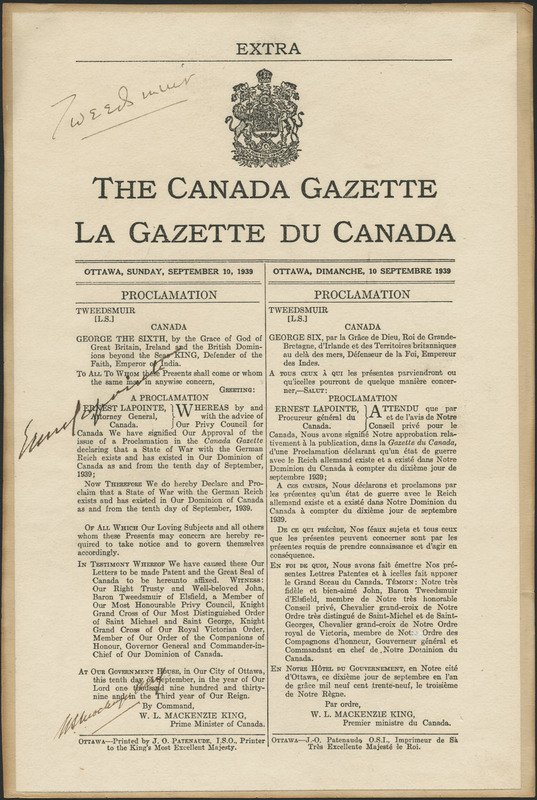 The staff of the Government Printing Bureau also produced a published version as an “Extra” edition of The Canada Gazette, the official organ for conveying government announcements. The Printing Bureau staff were locked into their office on Saturday and Sunday, to preserve secrecy, and were released only after the arrival of the published Gazette at the offices of External Affairs (then in East Block on Parliament Hill). The time of delivery was 12:35 p.m. EDT (another source says 12:40 p.m.), and by pre-arrangement this was agreed to be the moment that Canada could be considered to be officially at war against the German Reich. On October 24th, six weeks after Canada’s announcement, Massey cabled External Affairs asking when the formal submission with a minister’s signature would be received, as had been promised. The king’s private secretary, Sir Alexander Hardinge, had told Massey he was concerned that “the document which the King signed on the basis of cabled representations may well have no constitutional validity owing the fact that it did not and could not bear the actual signature of the minister.” In other words, there was some question as to whether Canada was technically at war at all. External Affairs went into action and sent a typewritten document signed by the prime minister and backdated to September 10th. King George VI signed this on November 27th and returned it to Ottawa. So it took two-and-a-half months after Canada had declared war for the official documents to catch up to the event! By J. Andrew Ross, archivist in the Government Archives Division, with contributions from Geneviève Couture, archival assistant in the Private Archives Branch, Library and Archives Canada. “My darling dearest Jeanie.” That’s how Joseph Gaetz began every one of the more than 530 letters he wrote to his fiancée, Jean McRae, during the Second World War. Stationed in England, France, Belgium, Holland and Germany during and after the Second World War, Joseph was, at times, desperately homesick. His deepest desire was for the war to be over so that he could return to Canada and marry his sweetheart. 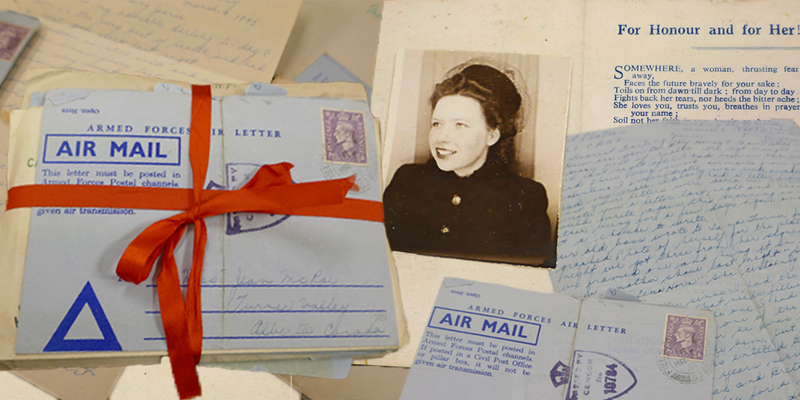 Between July 1943 and November 1945, Joseph wrote to Jean whenever he could, sometimes sending both an airmail and a regular letter in the same day. He also collected a number of souvenirs from German prisoners that he sent to Jean with his letters. In 2017, his three daughters, Cathy Gaetz-Brothen, Bonnie Gaetz-Simpson and Linda Gaetz-Roberts donated his letters and souvenirs to Library and Archives Canada. Joe and Jean on their first day of engagement. November 1, 1942, Turner Valley. Joseph Gaetz was from the small community of Faith, Alberta. His parents were Russian immigrants and he grew up speaking English and German. 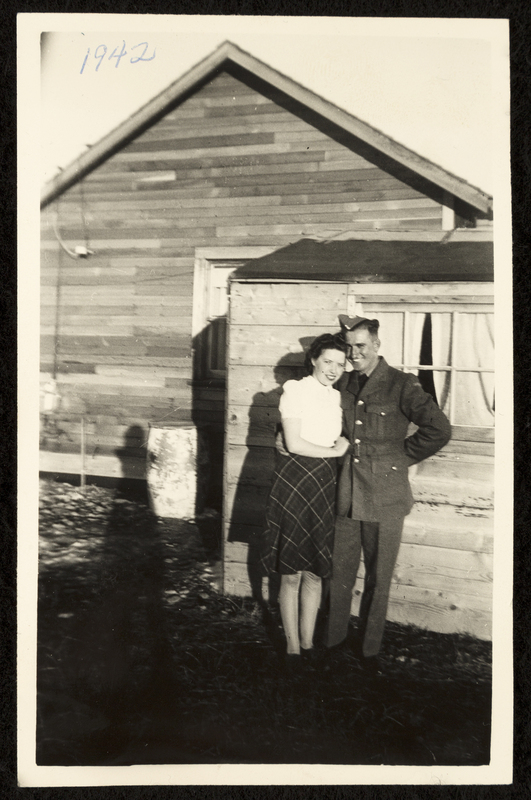 On 13 May 1942, he attested in the Calgary Highlanders; five months later, he became engaged to Jean McRae of Turner Valley, Alberta. In early 1943, he shipped out to England with the Canadian Infantry Reinforcement Unit. Royal Hamilton Light Infantry Scout Platoon. 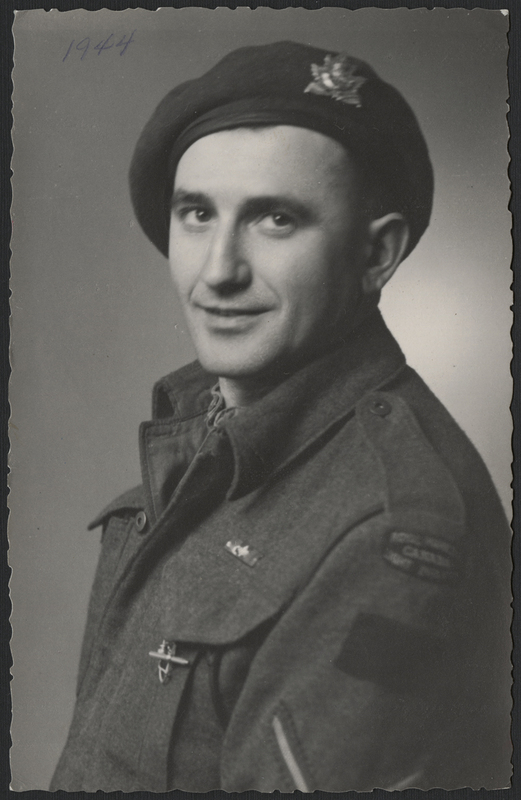 In August 1944, Joe was sent into action in France with the Royal Hamilton Light Infantry; he would soon move into Belgium and Holland. When his superiors realized that he spoke German, Joe became an interpreter with their scout platoon, going on a number of expeditions behind enemy lines to bring back German prisoners. In one letter to Jean from late 1944, he wrote, “My officer and I went a mile into the Jerry lines one night and took 52 prisoners to a barn…That was quite an experience.” In another letter, he told Jean how odd it felt to be capturing Germans who had lived in Canada before the war. In still other letters, he talks about picking up a pistol (one of several he acquired during the war) from No Man’s Land. Joe also told Jean how he got nervous before every patrol but learned to walk silently to avoid detection. He attributed his ability to avoid injury or capture to the photo of Jean that he kept in his breast pocket. He called it his “lucky charm” and said that all the other men had some sort of talisman. 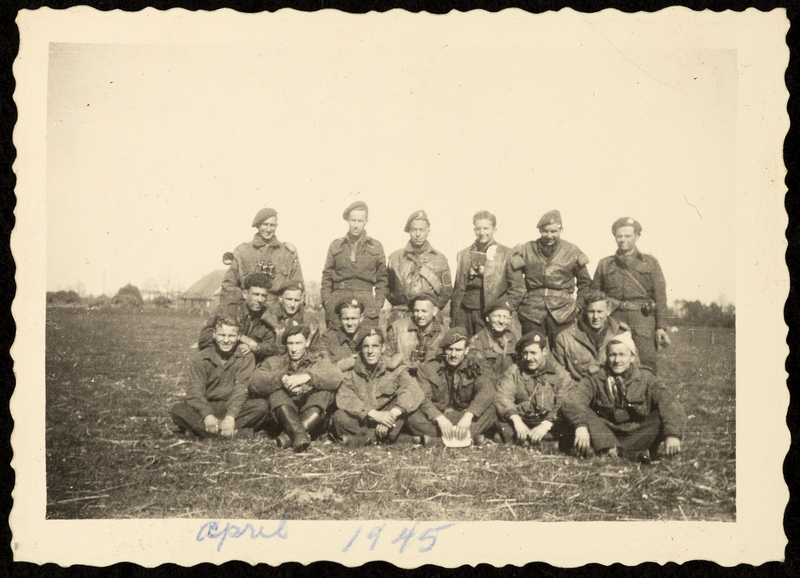 Joe’s ability to speak German allowed him to converse with the men they captured. Although Joe had no particular fondness for Germans, he did recognize their humanity and common plight. While guarding captured prisoners, or bringing them back to camp, Joe often talked with them. Sometimes he challenged their convictions—in one instance, he asked a group of prisoners if they thought Hitler was still a god. One young soldier, who surrendered, told Joe he was afraid he was going to be sent back to Germany after the war and shot for being a deserter. Joe told the young man not to worry; there wasn’t going to be a Germany after the war. Like many other soldiers, Joe kept a photo of his sweetheart tucked in the front of his Service Book, accompanied by a patriotic and moralistic poem entitled For Service and for Her! After inquiring about Jean’s health, he would reassure her that he was fine, tell her whether he had received her most recent letters, and then discuss the weather or some other inconsequential details. He followed these pleasantries with observations on military life—the routine chores he had to perform, what his accommodations were like, the food, who he’d met from back home, and so on. Conditions at the front were often harsh, but Joe rarely complained. In fact, he joked about sleeping in trenches he’d dug himself and constructing makeshift chimneys from empty tin cans. Joe had a strong sense of personal duty; he refused to send anyone else in to do his job, and he went for seven months without a single day of leave. In one letter, he stoically told Jean about spending Christmas Day 1944 on duty in No Man’s Land. Sometimes Joe and his fellow scouts were billeted with local families. Joe quickly picked up enough Flemish to be able to communicate with the people he came into contact with, and he writes how the locals would often invite the soldiers to dinner or offer to do their laundry. In his letters, he describes the little children he met, and he occasionally included photos of them in his letters home. He came back to Canada on November 1945 and was discharged in Calgary, Alberta, on January 18, 1946, at the rank of Sergeant. He worked his way up to manager of the Fort Macleod lumberyard and he and Jean were finally married on June 21, 1948. They had three daughters before he died at the age of 41 of chronic hypertension. Cathy Gaetz-Brothen, the youngest of the girls was only one-year-old when her father died. The letters he wrote to her mother are especially important to her because they allowed her to get to know a father she had no memory of. Joseph Gaetz didn’t have a particularly heroic war. He wasn’t a high-ranking commissioned officer leading a battalion; he didn’t singlehandedly storm any nests of German snipers. Instead he did what thousands of other Canadian soldiers did. He joined the army and fought alongside his fellow soldiers in the hope that he would one day come home to his sweetheart. Joe was one of the lucky ones. Visit the exhibition Premiere: New acquisitions at Library and Archives Canada at 395 Wellington Street in Ottawa. The exhibition, which runs until December 3, 2018, features our most recent acquisitions and celebrates the expertise of Library and Archives Canada’s acquisition specialists. A librarian or an archivist thoughtfully selected every one of the items in the exhibition and wrote the caption for the item that they chose. Admission is free. Katie Cholette is an archivist in the Specialized Media section of Library and Archives Canada. December 7, 1941—Japan attacks Pearl Harbour, Hawaii, United States of America. Japanese forces also invade Hong Kong, Malaysia and surrounding areas, opening up the Pacific Front of the Second World War. 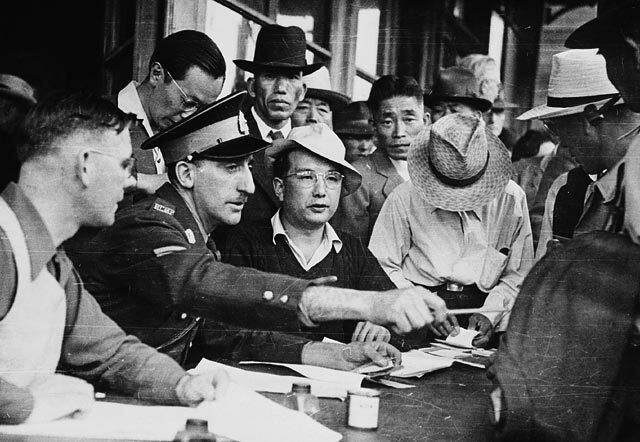 December 8, 1941—Canada invokes the War Measures Act and declares Japanese-Canadians and recent immigrants as enemy aliens to strip them of individual and property rights. Over 1,200 fishing boats owned by Japanese-Canadian fishermen are confiscated off the coast of British Columbia as a defensive measure against Japan’s war efforts on the Pacific Front. 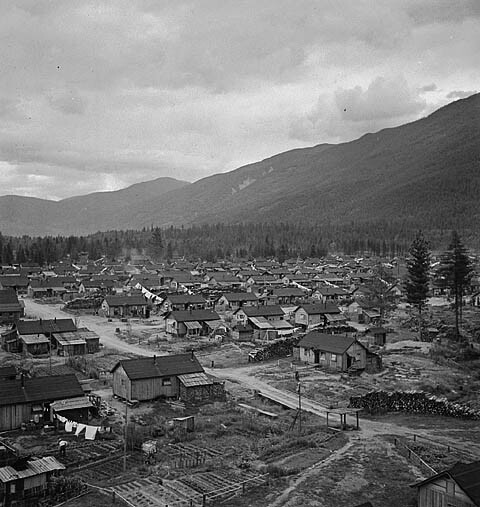 January 14, 1942—Canada orders the round up of Japanese-Canadian males aged 18–45 for relocation to the interior of British Columbia. 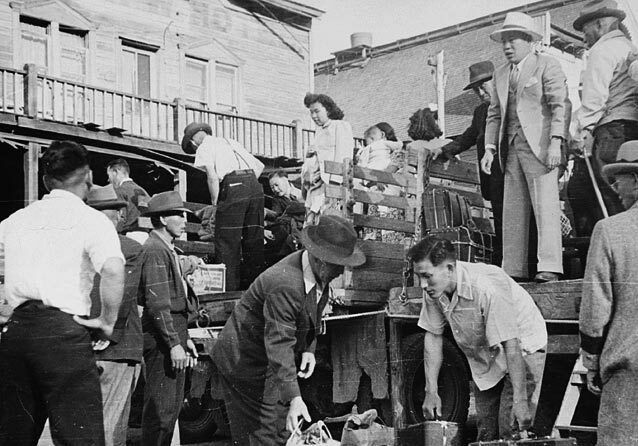 Personal property, such as homes and cars are seized and sold to help pay for the camps. No one can have radios, buy gasoline, or fish during the war. 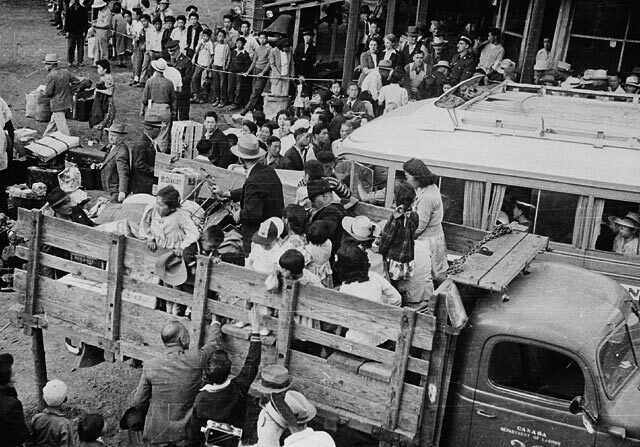 People detained after the 14th are sent to internment camps in Alberta. 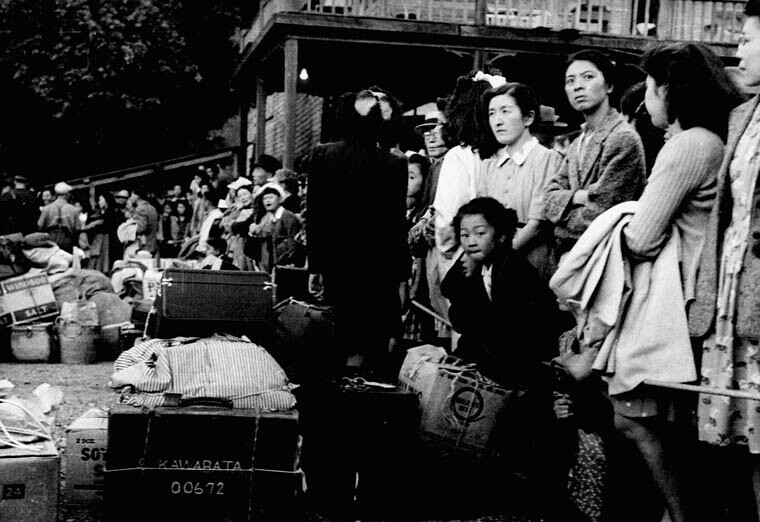 February 24, 1942—Whole-scale internment of people of Japanese descent starts. 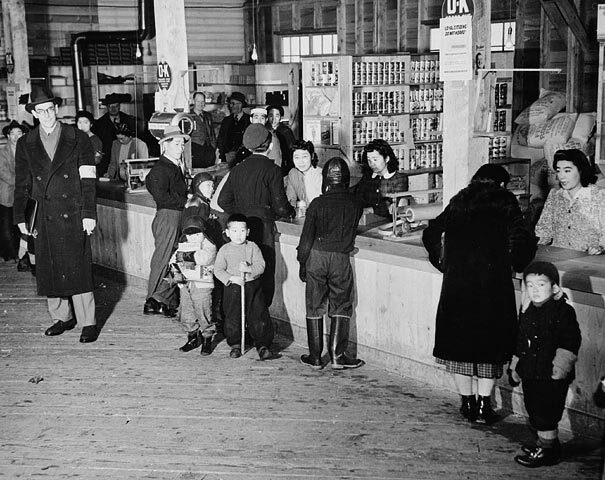 In total, 21,000 Japanese-Canadians and recent immigrants become internees at camps. Restrictions on rights and freedoms increase as the war drags on. 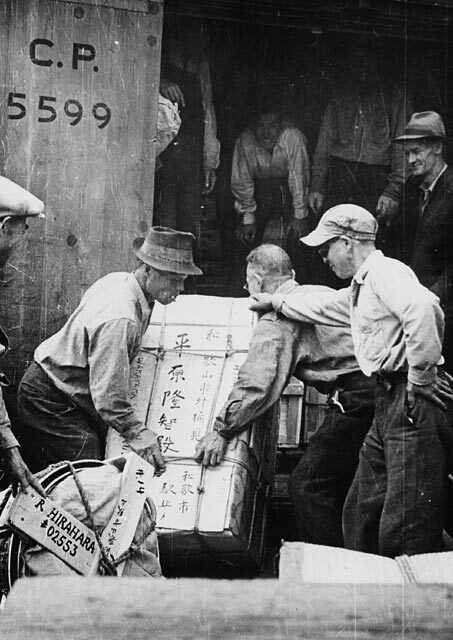 September 2, 1945 to April 1, 1949—After the end of the Second World War in 1945, Japanese-Canadians are forced to remain at internment camps, or areas away from Canada’s coastal regions until 1949. There are some offers by the Canadian Government to repatriate individuals and families back to Japan, along with some exemptions on movement. Eventually all restrictions on movement are lifted. 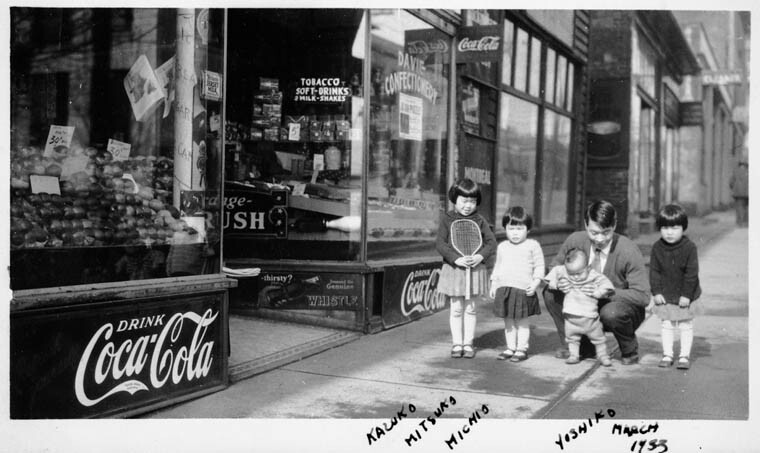 Japanese-Canadians can return to the coastal areas of British Columbia. No compensation is available for property seized or for forced internment. 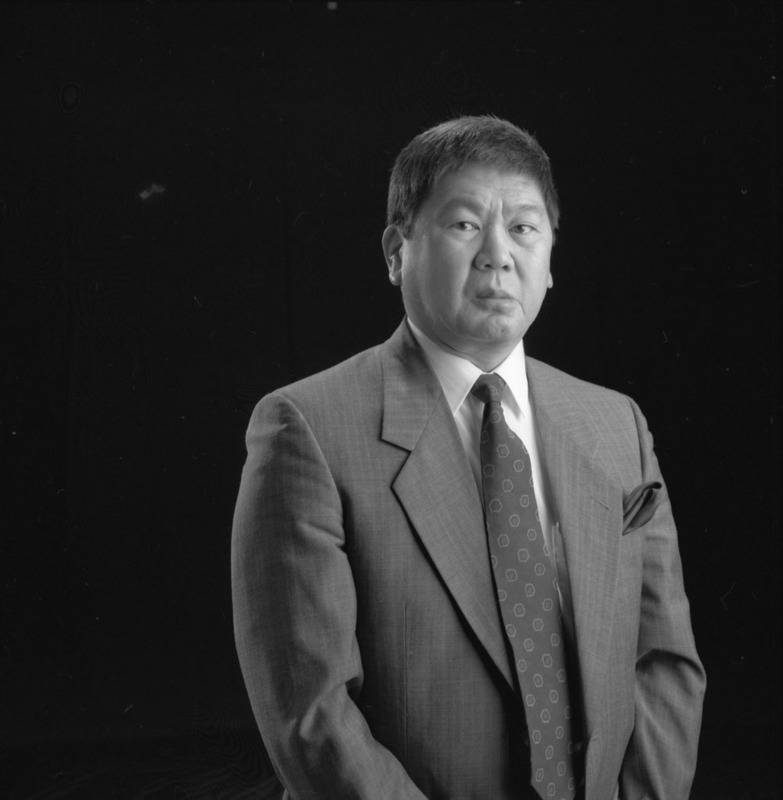 September 22, 1988—Thirty-nine years of lobbying by Japanese-Canadians affected by the actions enforced under the War Measures Act during the Second World War result in an official apology and compensation package for families from the Canadian Government. Warning: This article contains graphic images that may be disturbing to the reader; viewer discretion is advised. Seventy-five years ago today, Canadian soldiers landed on hostile shores in France to conduct a “reconnaissance in force.” Despite careful preparations, an armada of naval support and squadrons of aircraft overhead, the landing was a failure. Operation Jubilee was the code name for the Raid on Dieppe, an enemy-occupied port near Le Havre on the coast of France. 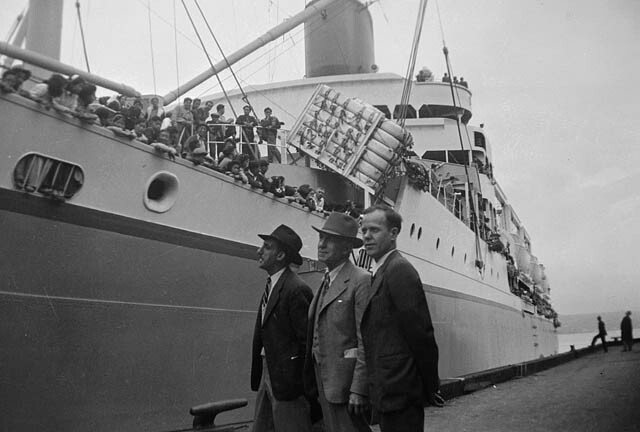 The plan was for a large fleet of landing craft and other ships to depart from England at night and to land soldiers in the early morning of August 19. Destroying the port’s fortifications would help to evaluate the strength of defences along Hitler’s Atlantic Wall. Other objectives included attacking a nearby German airfield and radar facilities, and seizing prisoners for interrogation. The force would then return to the landing craft in an orderly manner and depart from France. 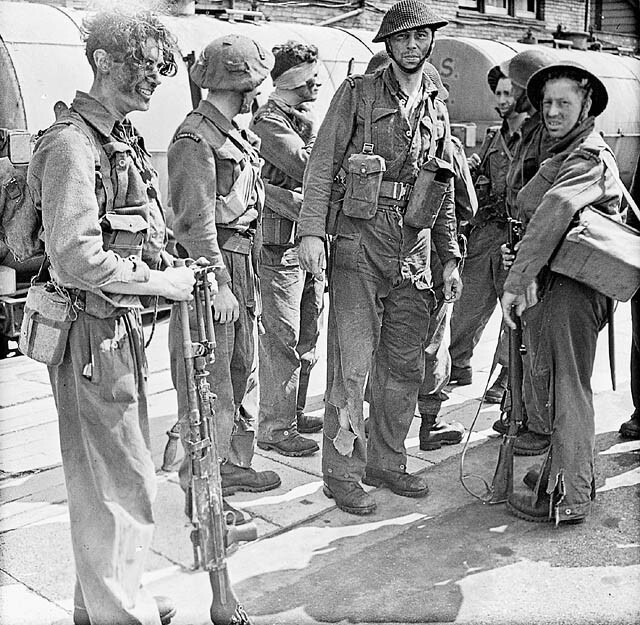 The main assault force was drawn from units of the 2nd Canadian Infantry Division, with British Royal Marines and commandos fulfilling specialized tasks, such as disabling coastal artillery that might target naval units and landing craft. 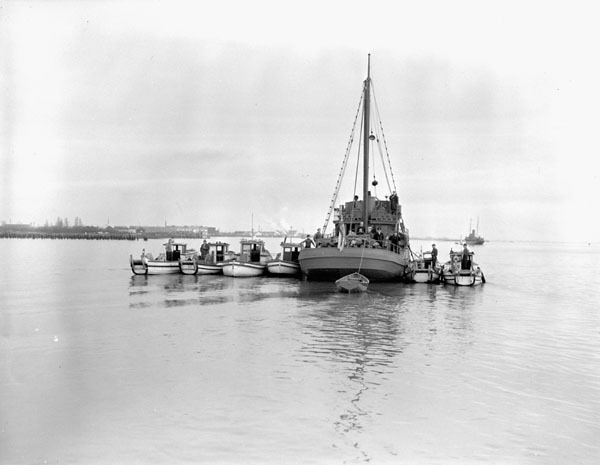 Churchill tanks from the 14th Army Tank Battalion (Calgary Regiment) would land in several of the newly developed tank landing craft, to help overcome defences and support infantry battalions with their assignments. 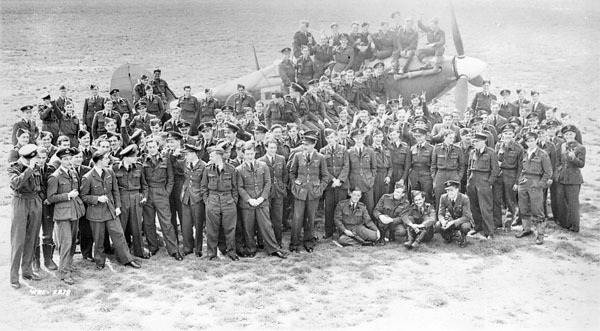 Squadrons of fighters and bombers, and a vast fleet of more than 230 ships, would support the landings. Aerial attacks and naval bombardment were expected to throw the defenders into disarray. The mission began to unravel as the landing craft neared the beach. The formidable defences had not been destroyed in the preparatory bombardment, and the defenders were forewarned by their military intelligence services to expect an attack. Machine guns in pillboxes swept the beaches with devastating fire, and few Canadian units succeeded in advancing inland, over the seawall, into the town or toward other objectives. Soldiers sheltered where they could and awaited an evacuation. 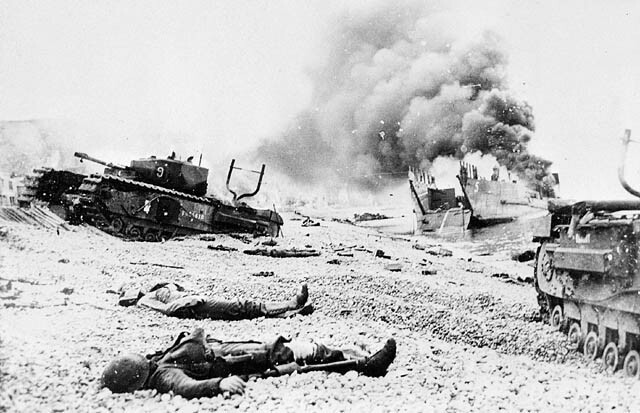 The materiel costs of the Dieppe Raid included all 29 tanks lost, 33 landing craft abandoned or destroyed, a British destroyer sunk, and more than a hundred Royal Air Force and Royal Canadian Air Force aircraft downed, with many of their crews killed. Historians continue to debate the underlying reasons why Allied authorities approved this risky endeavour. The attack failed for a variety of reasons; the consequences of that failure were felt in communities across Canada. 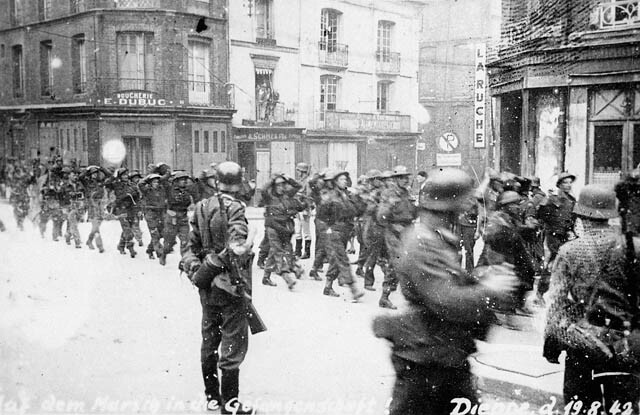 Out of almost 5,000 soldiers, just over 900 were killed, while almost 2,000 were captured. Many were wounded. August 19, 1942, was the deadliest single day of Canadian military participation in the war. News of the Dieppe Raid travelled quickly. The Department of National Defence sent out notifications to next-of-kin for the soldiers who did not return with the naval force. Families waited anxiously as survivors passed on information about the missing, and inquiries to the International Committee of the Red Cross led to lists of the dead whose remains had been located and buried, and lists of prisoners in German camps. One poignant example was the loss of Alice Montgomery’s sons Arthur and Ralph, who were twin brothers from Brighton, Ontario, serving with the 1st Battalion Royal Regiment of Canada. Arthur was killed on Blue Beach near the village of Puys, while Ralph died of his wounds two days later, in England. The majority of the Canadian war dead from August 19, 1942, are buried at Dieppe Canadian War Cemetery at Hautot-sur-Mer. This cemetery is unique: the wartime German layout, with its doubled headstones, was retained by the Commonwealth War Graves Commission after the war. 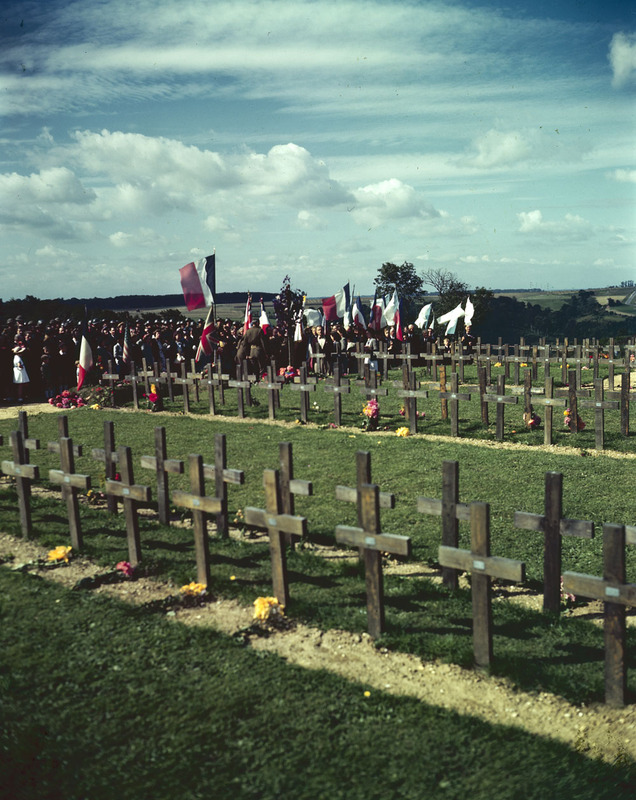 The image shows the cemetery in early September 1944, after the area was liberated from enemy control, and depicts units of the 2nd Canadian Infantry Division, the division that had been decimated in the Dieppe Raid, holding a ceremony to commemorate their fallen comrades. 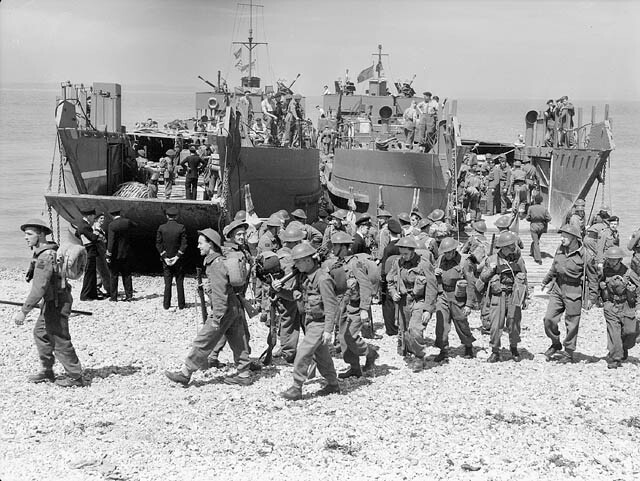 Library and Archives Canada (LAC) holds many records relating to the Raid on Dieppe. In addition to photos from the Department of National Defence and other private collections, there are war diaries from army units that participated, including the Essex Scottish, Royal Regiment of Canada, Royal Hamilton Light Infantry, 14th Army Tank Battalion (Calgary Regiment), Les Fusiliers Mont-Royal, South Saskatchewan Regiment and Queen’s Own Cameron Highlanders of Canada. LAC also holds the records of all personnel in the Canadian Armed Forces from the Second World War, including all those who died while serving. One interesting and little-known visual record of Dieppe is a small collection of photos acquired from an unusual source. The widowed Mrs. Delabarre, a resident of Le Havre, France, kept a handful of photos of Dieppe that her employer had given her. These images show abandoned equipment, and preparations for burying Canadian soldiers. For the 25th anniversary commemorations in 1967, she decided to donate the photos to help tell the story of Dieppe to Canadians. Mrs. Delabarre sent them to a Canadian Army representative, Major-General Roger Rowley, who entrusted them to the care of the Department of National Defence’s Directorate of History. Years later, they were transferred to the National Archives. These images in LAC’s collection, two of which appear below, offer a unique alternative to photos taken by the German Army to document the failure of the operation. The first photo shows “Buttercup,” a Mk. 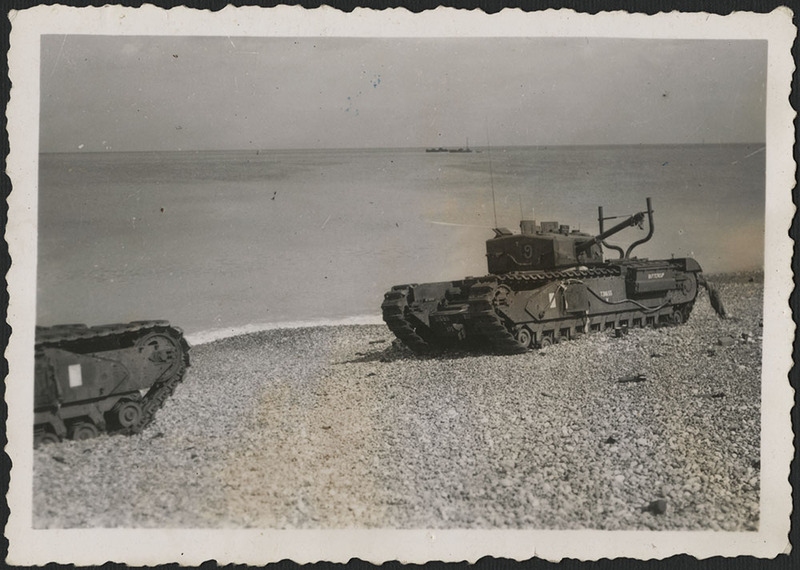 3 Churchill tank with B Squadron, 14th Army Tank Regiment (Calgary Regiment), abandoned on the beach. Some of the Delabarre photos, like those taken by German Army photographers, include graphic images of dead Canadian soldiers on the beach, under the seawall and in the stranded vessels. The images can be difficult to look at, but they are important archival records of the event. 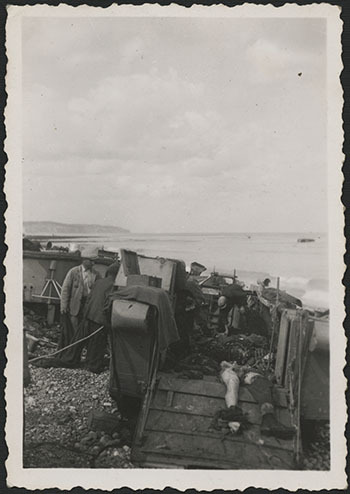 For instance, this second photo documents a little-known aspect of the aftermath of the Raid on Dieppe. Instead of showing German military personnel inspecting derelict vehicles and landing craft, and viewing wounded and dead Allied soldiers, the photo shows teams of civilians moving and preparing bodies for burial, and they are performing this grim task in the confines of an assault landing craft. Seventy-five years ago today marks the creation of the Women’s Royal Canadian Naval Service (WRCNS). Established on July 31, 1942, the WRCNS was the last of the three services to open its doors to women during the Second World War—the Royal Canadian Air Force Women’s Division (RCAF-WD) and the Canadian Women’s Army Corps (CWAC), having been created a year before. Those serving with the WRCNS were commonly called “Wrens,” the nickname used by their British counterparts, who were members of the Women’s Royal Naval Service (WRNS). The women who joined the navy in Canada did so with the expectation that they would not serve on ships; rather, they carried out duties on shore so that more men could serve at sea. 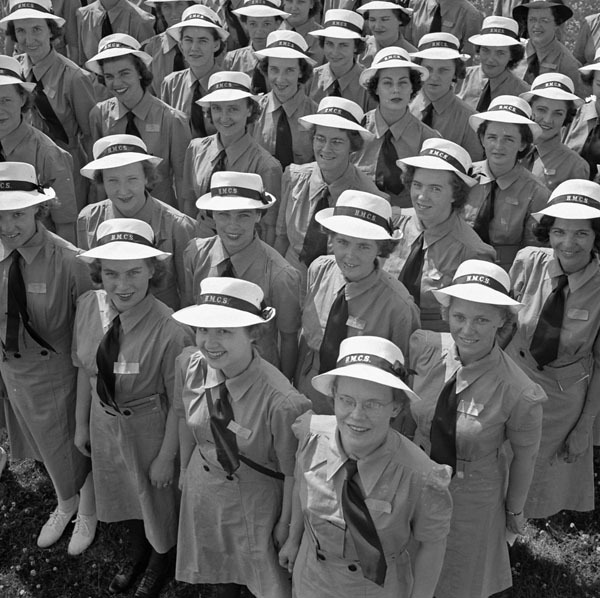 The need for women to staff positions on land became particularly important with the increased casualties that came with the Battle of the Atlantic. The first class of Wrens consisted of only 67 members, but by the end of the war, nearly 7,000 women had enlisted with the WRCNS. Wrens trained on “land ships” designated “Her Majesty’s Canadian Ship.” For example, HMCS CONESTOGA at Galt (now Cambridge), Ontario became the basic training centre for the WRCNS beginning in the fall of 1942. 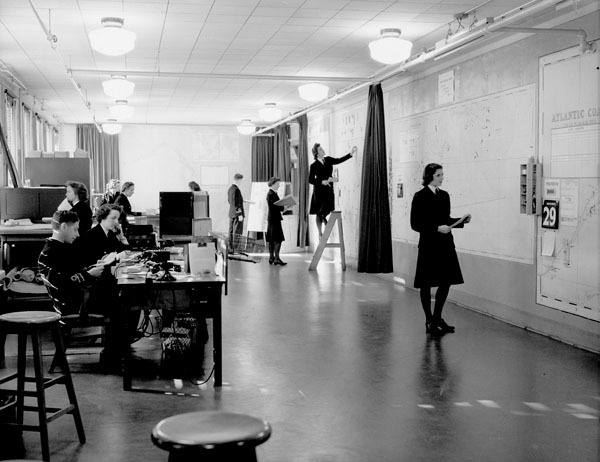 Other training locations included HMCS CORNWALLIS in Halifax, and HMCS ST. HYACINTHE in Saint-Hyacinthe, Quebec, which hosted a communications school. Following training, recruits took on a variety of jobs, including work as cooks, mailroom workers, drivers, visual signalers, and plotters (locating and tracking the positions of vessels). Members of the WRCNS made important contributions to the war effort both in Canada and overseas. 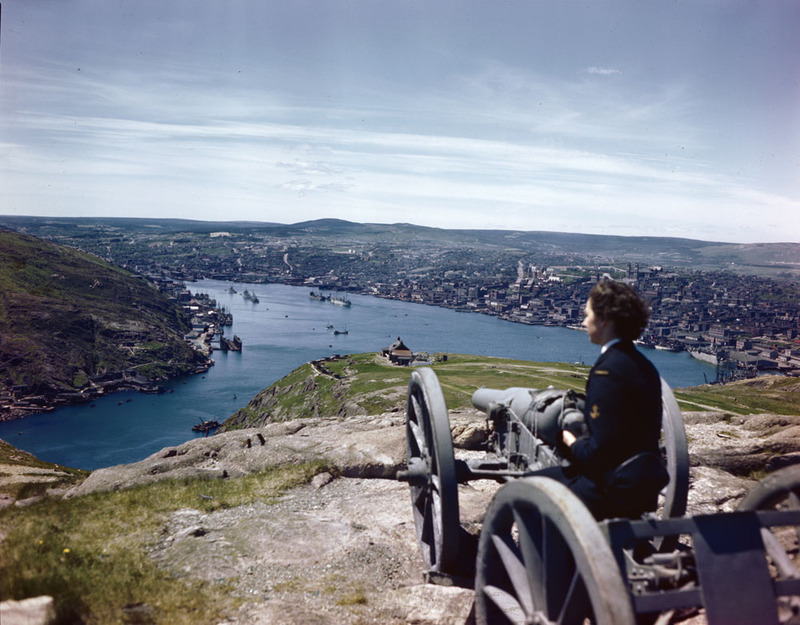 Approximately 1,000 Canadian women served with the WRCNS abroad during the war, of which half were posted to Newfoundland, a location that was considered an “overseas posting” as Newfoundland did not become part of Canada until 1949. 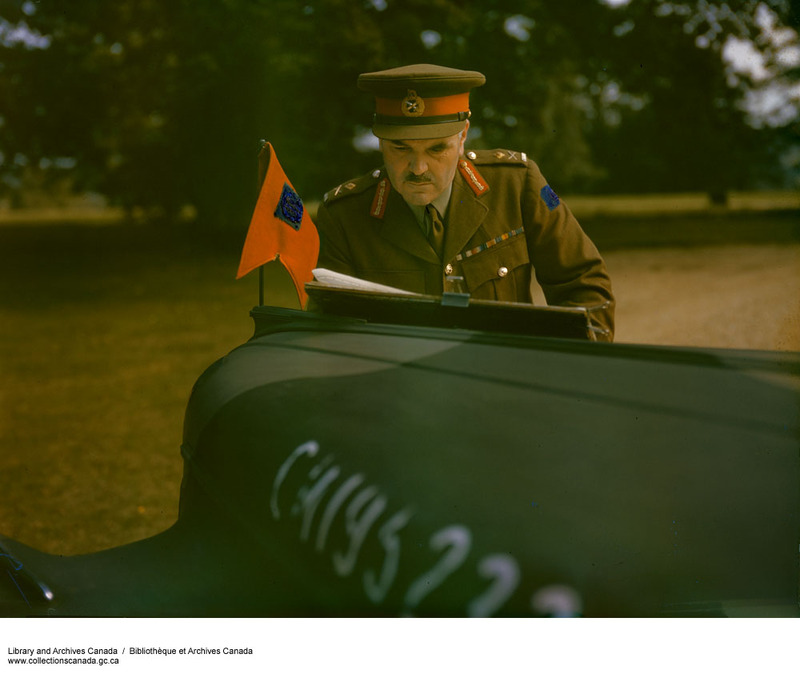 Library and Archives Canada has a rich collection of documentation about the WRCNS, including the fonds of Adelaide Sinclair, the Director of the WRCNS from 1943 to 1946, whose service was recognized in 1945 through the award of the Order of the British Empire. Check out the links below to learn more about the incredible stories of Canada’s first members of the WRCNS. Royal Canadian Navy Headquarters Central Registries (MIKAN 157647).This series in the Department of National Defence fonds contains includes a variety of documentation on the WRCNS, including information on recruitment and staffing. Isabel Janet MacNeill fonds (MIKAN 101945). A long-serving member of the WRCNS, Isabel MacNeill became the first woman to command a land ship in the British Commonwealth. Katherine A. Peacock fonds (MIKAN 101865). 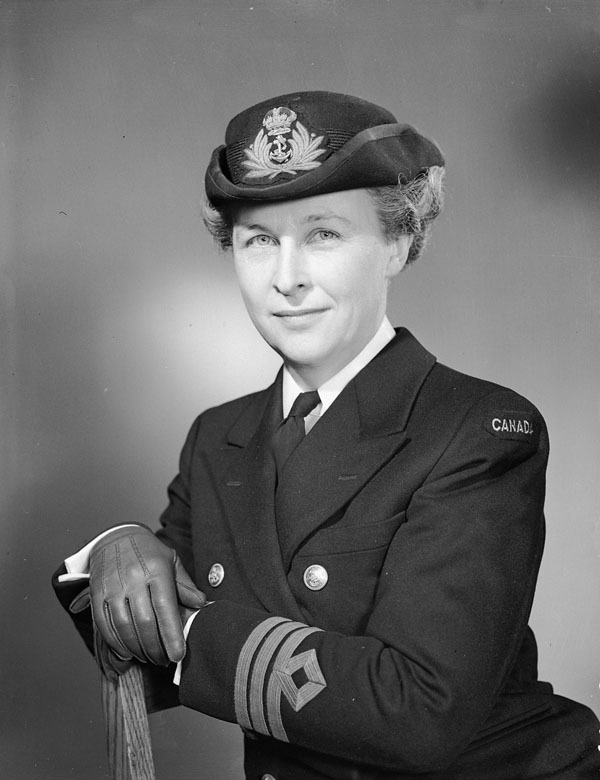 Katherine Peacock served with the WRCNS during the Second World War and later became a federal public servant. Colour photos of Canadian Second World War soldiers. Laura Brown is a Military Archivist in the Government Archives Division. Canadian War Artists brings together the portraits of eighteen Canadian war artists who painted during the Second World War. These portraits, from the collections of Library and Archives Canada are accompanied by short biographies. 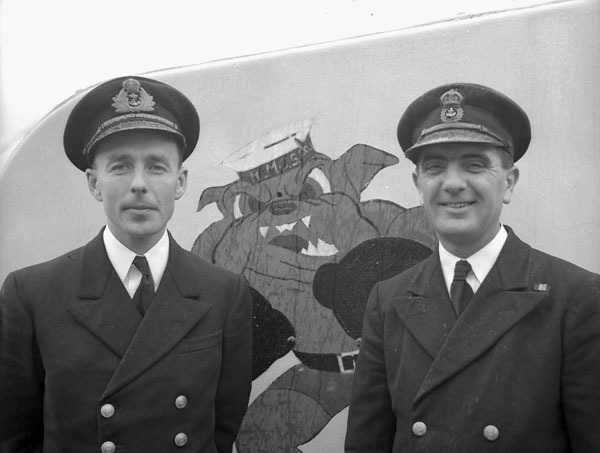 On September 10, 1941, off the coast of Greenland, the crews of two Royal Canadian Navy (RCN) corvettes, Her Majesty’s Canadian Ships (HMCS) Chambly and Moose Jaw, were able to locate and sink U-501 as the U-boat lay in wait to ambush Allied Convoy SC-42, sailing from Sydney, Nova Scotia, with supplies for Great Britain. The two corvettes were to take part in training exercises at sea, so that their crews, largely made up of recruits, could become familiar with anti-submarine warfare. In the face of the growing threat from German submarines, the two vessels quickly ended their training to reinforce the Allied convoy. 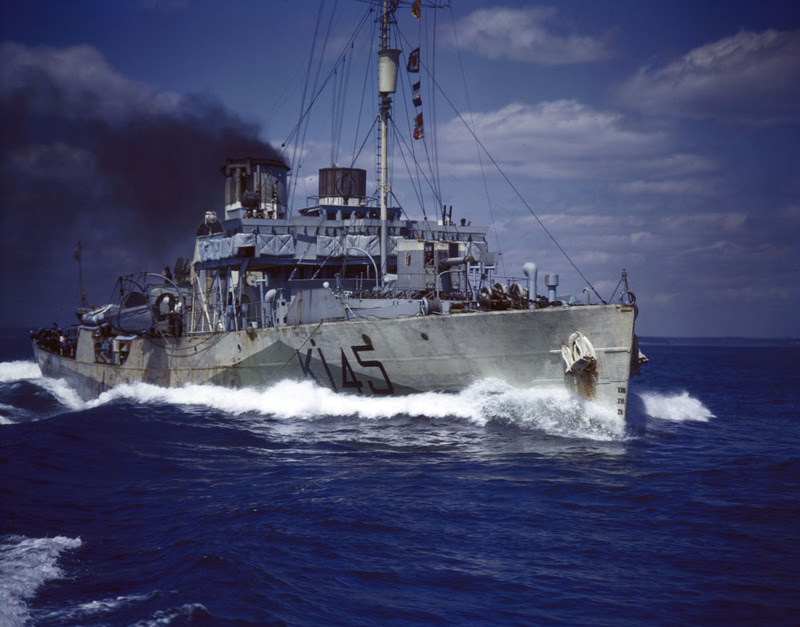 HMCS Arrowhead, a corvette of the same class (Flower) as HMCS Chambly and HMCS Moose Jaw (MIKAN 4821042). An RCN expert in anti-submarine warfare, Commander James D. “Chummy” Prentice, Chambly’s captain and Senior Officer Corvettes, quickly decided that the best option would be to move ahead of the convoy to surprise any German submarines. The navigation skills of Mate A. F. Pickard made it possible for the two corvettes to reach the area identified by Prentice in less than six days. At about 21:30, Chambly got an ASDIC (better known by its American name, “sonar”) contact. Quickly, Chambly’s crew began releasing five depth charges. Despite a few mistakes owing to inexperience, the first two charges caused enough damage to force the submarine to surface close to Moose Jaw. Surprised by the appearance of the U-boat, the crew of Moose Jaw was unable to open fire immediately with either their rapid-fire naval gun or the machine guns. Lieutenant F. E. Grubb, commanding officer of Moose Jaw, rapidly gave the order to advance on and ram the submarine. Far from being a complete improvisation, this was a manoeuver often attempted by Canadian corvettes. At close range, it was the best option for sinking German U-boats which, at night, in rough seas, presented a small moving target. Before the initial charge, Lieutenant Grubb was astonished to see the German captain abandon the submarine to leap onto Moose Jaw’s deck! However, it was only after being rammed by the corvette, under fire of its naval gun, that the U-boat halted. 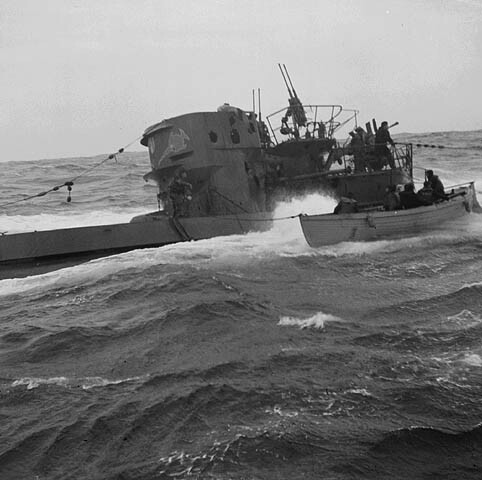 A boarding party from HMCS Chilliwack in a whaler alongside German submarine U-744, March 6, 1944 (MIKAN 3623255). A boarding party from Chambly, led by Lieutenant E. T. Simmons, attempted to take possession of the submarine. The attempt had to be abandoned, because the U-boat was sinking rapidly. One member of Chambly’s crew, William Irvin Brown, drowned during the operation. Like the more than 200 crew members of the 15 merchant ships in the SC-42 convoy sunk by German submarines, the Toronto native, father of a one-year-old daughter, gave his life to supply Great Britain and the armed forces protecting it. Many other Canadians also lost their lives during the Battle of the Atlantic. Service File of William Irvin Brown, A4212, RG 24 29029. 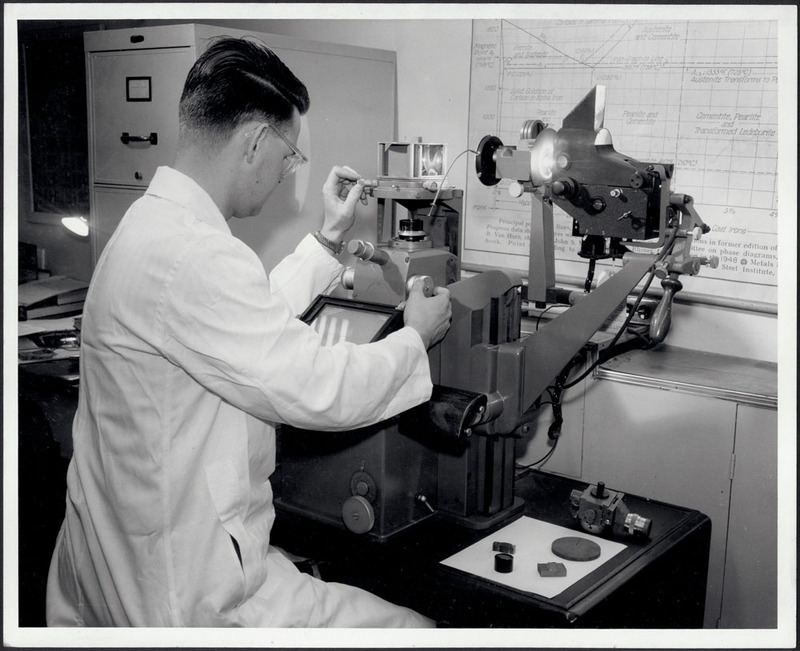 Renaud Séguin is a military archivist in the Government Archives Division at Library and Archives Canada. 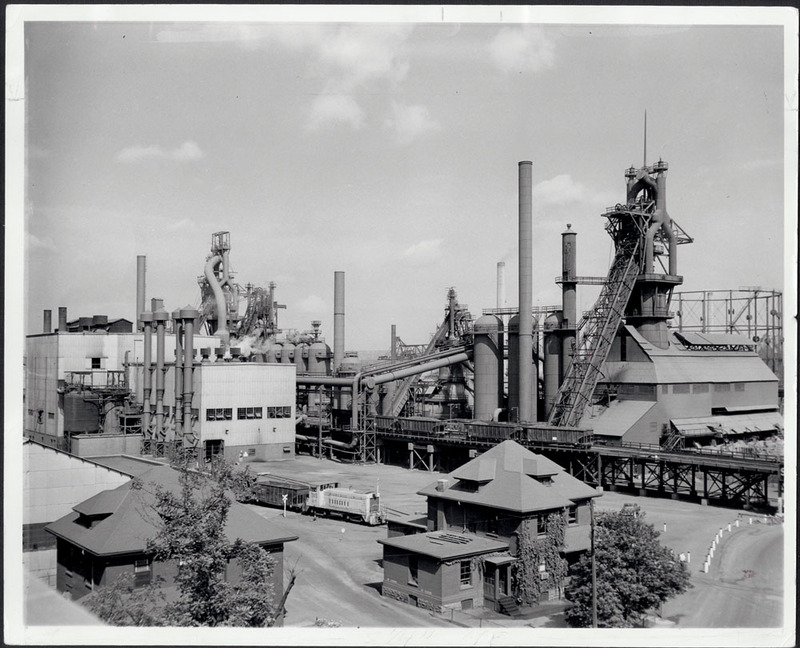 Library and Archives Canada is proud to announce that it has acquired the archives of The Steel Company of Canada, more commonly known as Stelco. These archives are now part of our national heritage. They include more than 100 metres of textual records, thousands of photographs, technical and architectural drawings, and over 200 film and sound recordings. 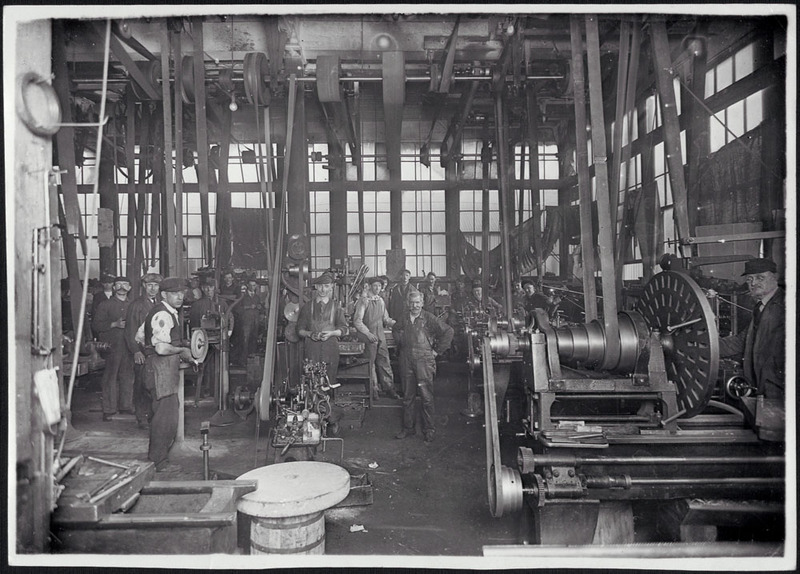 The Steel Company of Canada (Stelco) fonds, currently in archival processing, documents all aspects of the evolution of the steel industry from the beginning of its mechanization in the 1880s through to the 1980s. 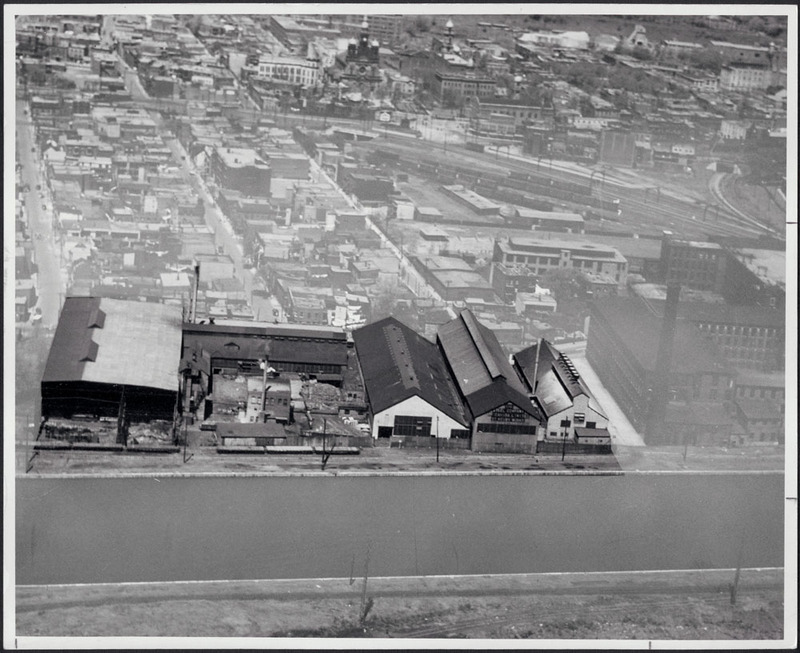 The Steel Company of Canada Limited was formed in 1910 as a merger of five companies that had previously taken over some 40 smaller ones, operating in various areas of Quebec and Ontario: Hamilton Steel and Iron Company Ltd., Montreal Rolling Mills Company, Canada Screw Company, Dominion Wire Manufacturing Company, and Canada Bolt and Nut Company. 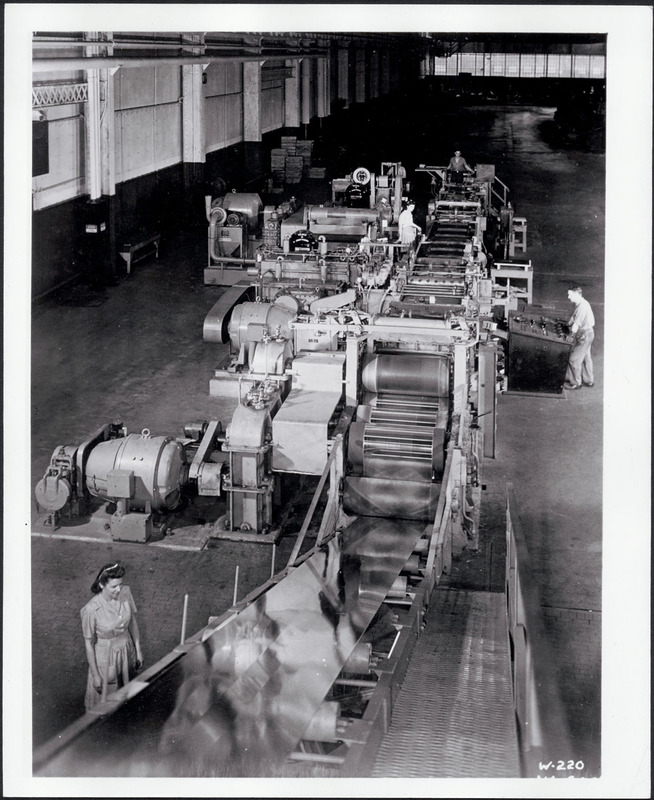 Each one had its own speciality, from the primary production of steel for the rail, agricultural and marine sectors to consumer products. This new, large company enabled the Canadian steel industry to keep pace with strong American and European competition. The account ledgers, correspondence, management minutes, patents and photographs provide a detailed account of the beginnings of this industry, its development and its challenges. The archives not only document the company’s expansion, but also the development of several entire cities, towns and neighbourhoods. In the mid-twentieth century, the plants attracted many immigrants and the population in urban centres doubled in just a few short decades. 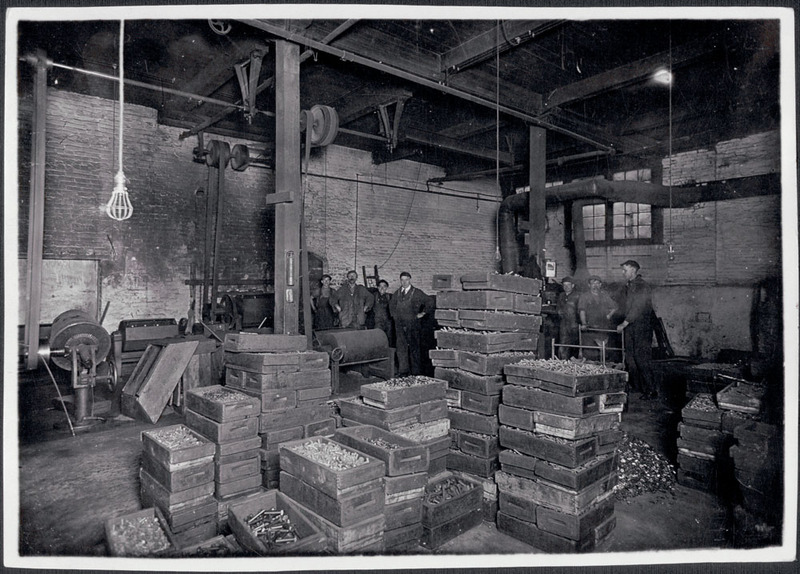 The Stelco archives bear witness to the working conditions of men and women who spent their whole lives in the plants. 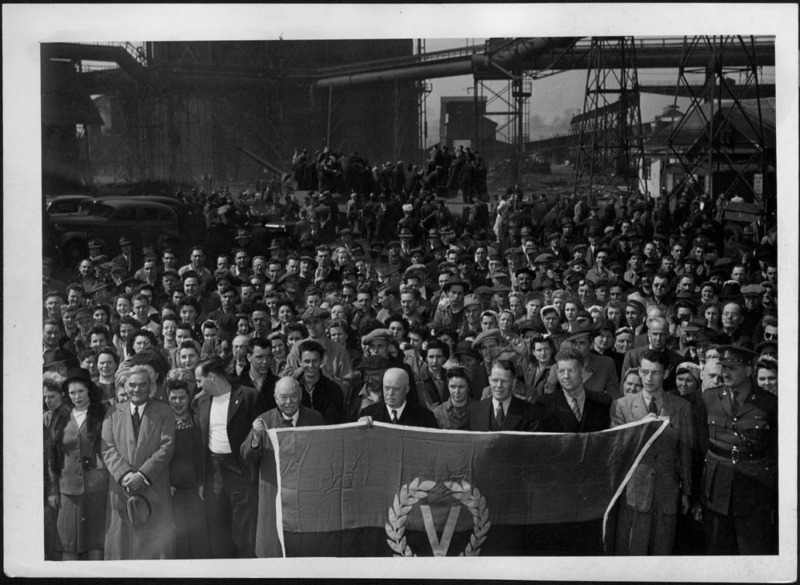 Stelco and its workers had important responsibilities during the First and Second World Wars, responding to the demand for military materiel from the Canadian and British governments and contributing to the Allied victory. But success did not stop there. 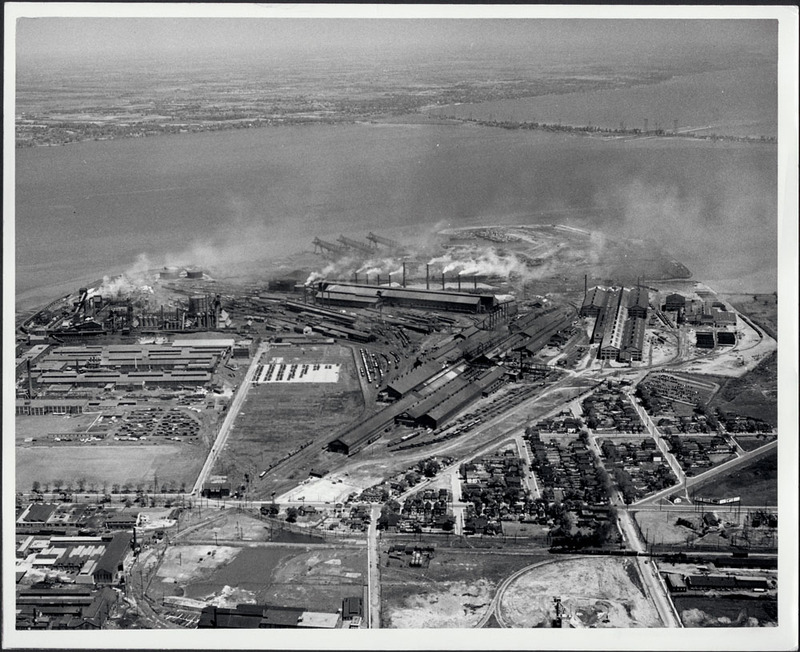 The phenomenal growth of urban centres during the 1950s, real estate, energy resources, means of transportation and various consumer products created strong demand for steel. 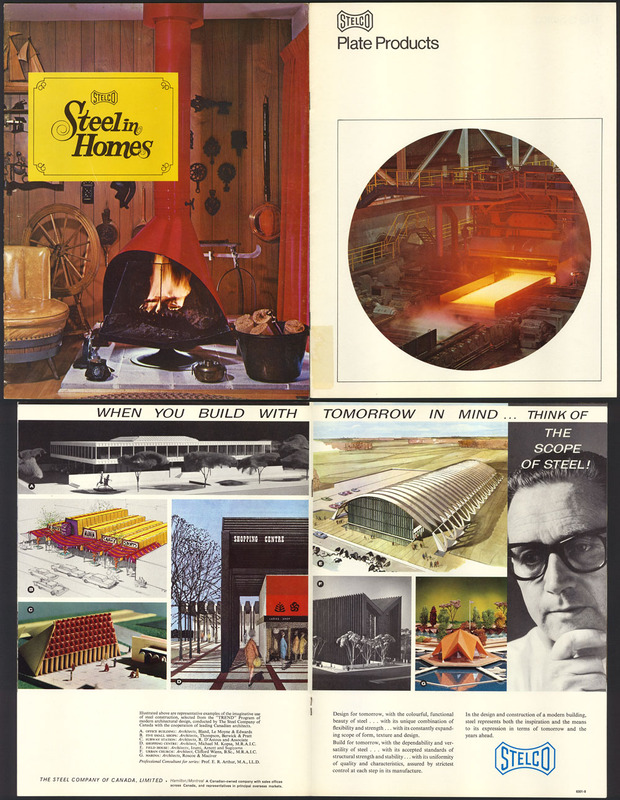 There followed the creation of large industrial complexes and the introduction of a high-tech research centre, which enabled Stelco to develop new steel products and increase operations and production in all areas, both residential and commercial. The Steel Company of Canada Limited (Stelco) exported its products worldwide, becoming one of the largest steel companies in North America. 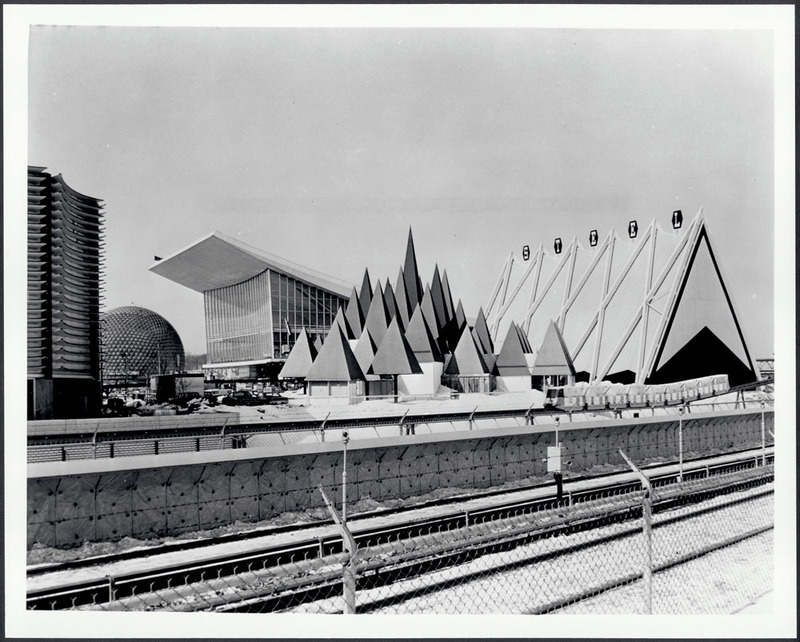 As an example, it was actively involved in the design and construction of the Expo 67 Steel Pavilion. Over the coming months, we will introduce you to the world of Stelco—its plants, directors, employees, operations, innovations, products and challenges, as well as its social, sports and cultural activities. Lucie Paquet is an archivist with the Science, Governance and Political Division of Library and Archives Canada.